We are available anytime to answer questions, book tours, or assist in any way we can. Hi I'm interested in planning a trip possibly to Loreto would this be something you could accommodate? We would be a group of 3 to 4+ jeeps. I would like to plan for March-May of next year. Obviously this is in the early planning stages so please give me any feedback you may have? We can help you with this. Please email info@camp4lo.com or feel free to call 951-251-4456 anytime. We can help you plan. 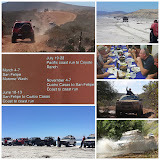 My wife and I are looking to plan a week road trip through a bit a of Baja at about April 2019. Looking for some lite wheeling to get to some remote locations as day trips, visiting a few old missions, bit of bazaar type shopping and warm beaches. We have a 02 Tahoe 4x4 lifted 2 inches on 34" tires and torsion rear diff. May add a front winch by then. Wife is not into camping without bathrooms. Anyways, we are a bit uncomfortable traveling beyond the populated areas on remote roads alone. I'm sure there are others like us, so I'm looking for some advice where to find others that would like to plan a trip like this starting from San Diego. One thought is join Overland Bound to see if we can find others. I'm not sure if this is just to easy of a trip for your organization.